NASA’s Curiosity Mars Science Laboratory landed on Mars earlier this morning, marking a new era of exploration on the Red Planet. Learning about Curiosity is a good opportunity to review ITGS topics such as data logging, the Environment area of application, and the Higher Level topic Artificial Intelligence, Robotics, and Expert Systems. NASA’s initial attempt at a Mars lander did not go well: in 1998 a software error caused its $125 million Mars Climate Orbiter to be destroyed during landing. Future missions were more successful however, with the Spirit and Opportunity rovers being active much longer than expected. The goal of the Curiosity mission is to discover whether life may once have existed on Mars. The robot contains a variety of robotic input and output devices including several to assess the weather, and a laser and scoop to break up and sample rock chemistry. There are also a wide variety of cameras. Navcams, ChemCams, HazCams, and Mastcam are each positioned on different parts of the robot, depending on their task. The Mars Science Laboratory is NASA’s main page detailing Curiosity. As well as being informative, this is a good demonstration of how IT tools like web pages can be used to teach students: there is a wide variety of interactive material, including a 3D view of the Martian surface and the current status of the rover. If you want to follow Curiosity’s latest developments, the robot also has its own Twitter feed. 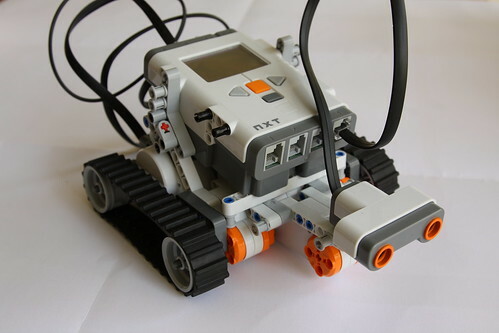 If Curiosity excites the roboticist in you, the ITGS Textbook web site has some lesson plans and help sheets for the LEGO Mindstorm robots, including navigation and movement exercises. These robots are not required for ITGS, but they are great teaching aids and can really help students understand aspects of the Higher Level topic, including movement, obstacle detection and avoidance, and input and output devices. A good book about Curiosity is the NASA Mars Rovers Manual, which details the system’s hardware and software and also covers the Sojourner, Spirit, and Opportunity rovers.